Add a finishing touch to your wipe clean tablecloth with rounded corners. Add that finishoing touch to your Wipe Clean Tablecloth with our Bias-Binding hemmed edge. 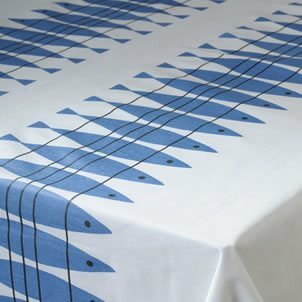 What Are Acrylic Coated Tablecloths? Acrylic coated tablecloths, also known as Teflon coated tablecloth, rather than having a PVC coating such as oilcloth fabric; acrylic is soaked with a Teflon-based coating. Unlike oilcloth, acrylic can be placed in a washing machine on a low heat but can also be wiped down with a damp cloth just like oilcloth. We have some really stunning acrylic wipeable tablecloths that are in stock. Our designs range from animal inspired designs to Scandinavian inspired acrylic wipe clean tablecloths. If you aren't sure if acrylic is the right fabric for you, why not check out our fabric comparison chart. For the crafters out there - all our acrylics can be used in just the same way you would use a PVC oilcloth tablecloth. If you require bias-binding hemming sewn on or one of our extra-wide sewn-together tablecloths we can do that with acrylic. How Wide Are Acrylic Coated Tablecloths? Our range of acrylic tablecloths has the added bonus of being wider than standard oilcloth at 140cm. Some of our Scandinavian acrylic tablecloths are up to 146cm in width. This means that we can cut extra-wide round tablecloths for you as the standard maximum diameter is normally 130cm. If you have any queries regarding our range of acrylic Teflon-coated wipe clean tablecloths then please contact us and we will be more than happy to help.